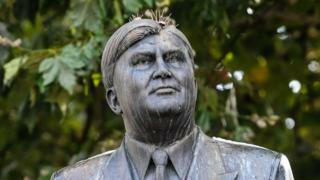 A Cardiff statue of NHS founder, Aneurin Bevan, has been fitted with plastic spikes to stop birds pooing on its head.The 15ft (4.5m) high statue has been used as a loo by pigeons and seagulls.The statue has stood proudly at Cardiff's Queen Street for more than 30 years.Supporters launched a campaign to make him appear more healthy - and officials came up with the three rows of spikes. "He is meant to look strong and proud not covered in bird poo." The spikes aim to stop sights like this. Council officers were called on to help protect the historic statue to mark the 70th anniversary of the NHS.Cardiff councillor Keith Jones said: "We have people coming here from all over the world and the statue itself is world renowned. "Residents have complained about it and the business community themselves have concerns about the state of it. "The current state is just not good enough by anyone's criteria. "It's an iconic statue and we want it to be in the best state it can be in. "We're going to look into how often it's cleaned, manage how we can deter seagulls from the vicinity of the statue, and anything else we can look at. "There is such a universal well regard for him and the decisions he's made for the legacy of future generations. What we're trying to do with the statue is make sure it's there for the future." Along with the spikes, the statue will also have it gold lettering repainted and its base refurbished.Cardiff Council say they will "continue to monitor the situation" in the hope the spikes will solve the issue.